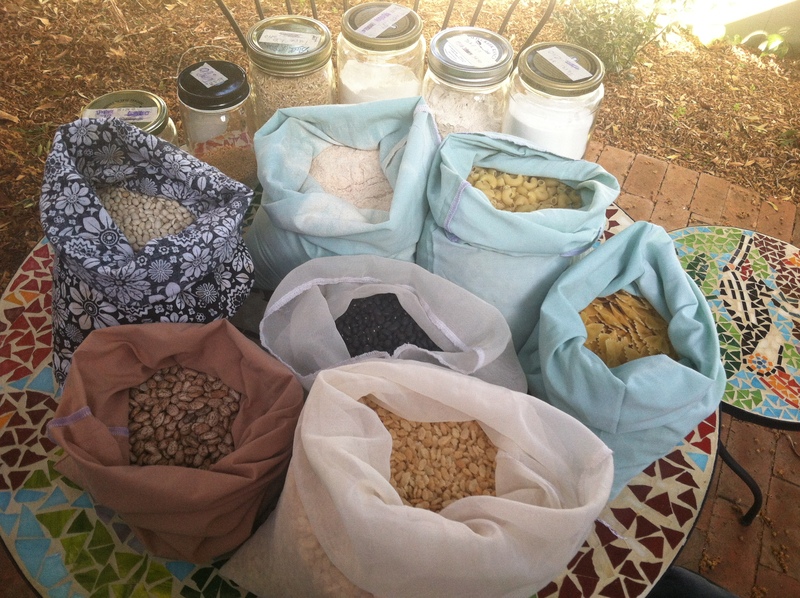 Beans, legumes and rice of all kinds. Pasta in different shapes and varieties—semolina, corn, gluten-free, whole wheat, with eggs, without eggs. Nuts and seeds for munching on (cashews, tamari almonds, pistachios, sunflower seeds) or for baking and cooking (pecans, walnuts, hemp seeds). 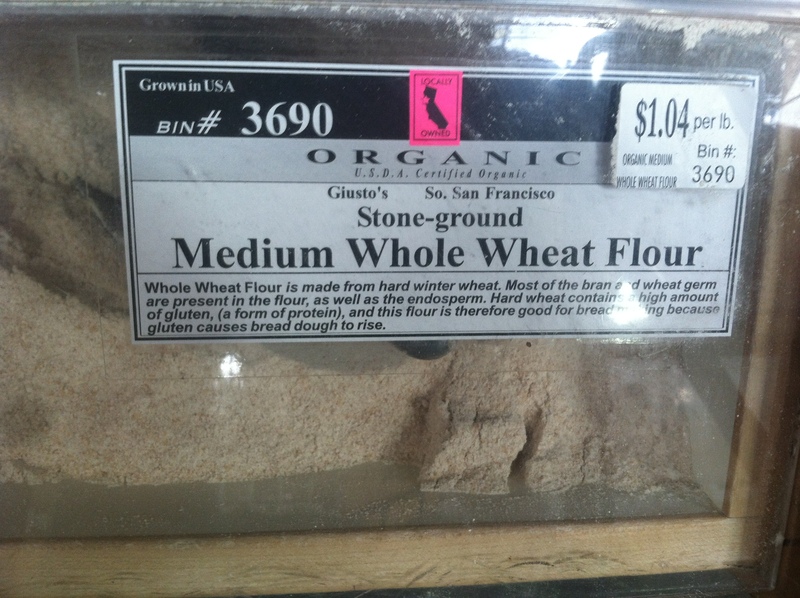 This is only SOME of the flour available! Flours like whole wheat, bread, rice, gluten-free, rye, buckwheat, teff (I don’t even know what teff is, but it looked good and I saw two types) and I forget what else. The picture above shows just one section of the flour bins! OMG I was so excited (maybe I should get out more). Sugars like brown, coconut, sucanat, maple, granulated. I’m trying to cut out sugar, but still, I was impressed. Baking goodies like shredded and flaked coconut (I avoid coconut because it isn’t local, but if I want it, I know where to go) and chocolate chips, wafers and cubes in different sizes (I refuse to give up chocolate). Tons of cereal. 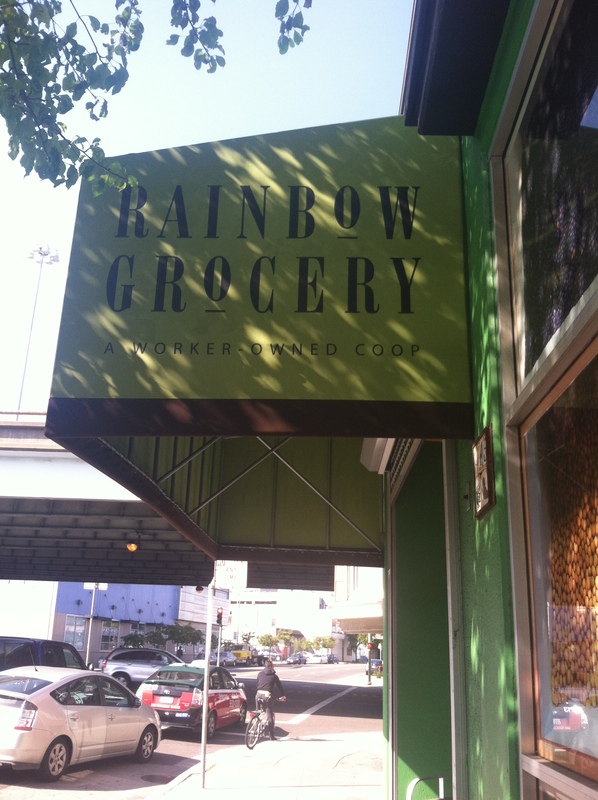 I make my granola, but I may buy some there the next time I go. I saw bin after bin of the stuff (please, no hippie jokes). 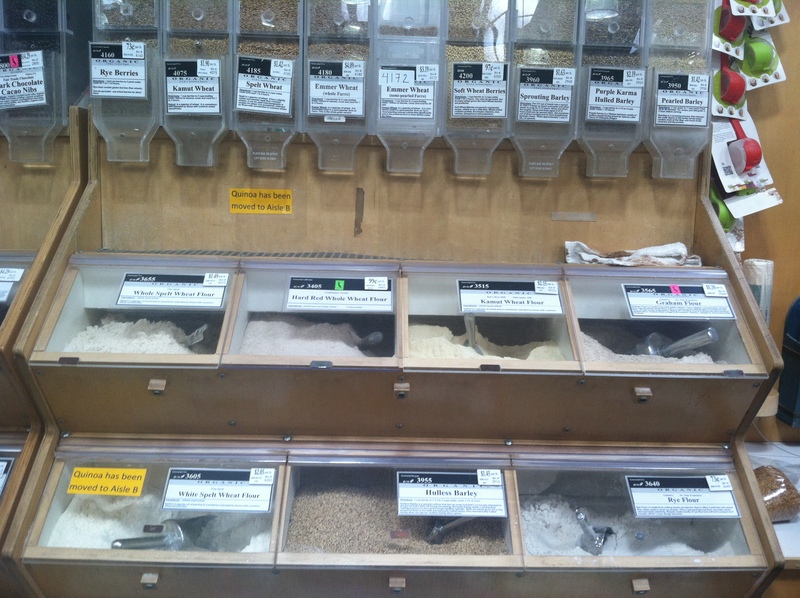 I also found several flavors of dried cereal (my 13-year old is rebelling against the unprocessed regimen…). Tea. I stick to black, caffeinated Earl Grey or English Breakfast, but you can get all sorts of herbal varieties too. You can buy bulk coffee too I’m pretty sure. Spices and herbs! I forgot Rainbow sells these. I need to stock up next time (I had only so many jars today). Dried mushrooms. We’re talking several bins worth. 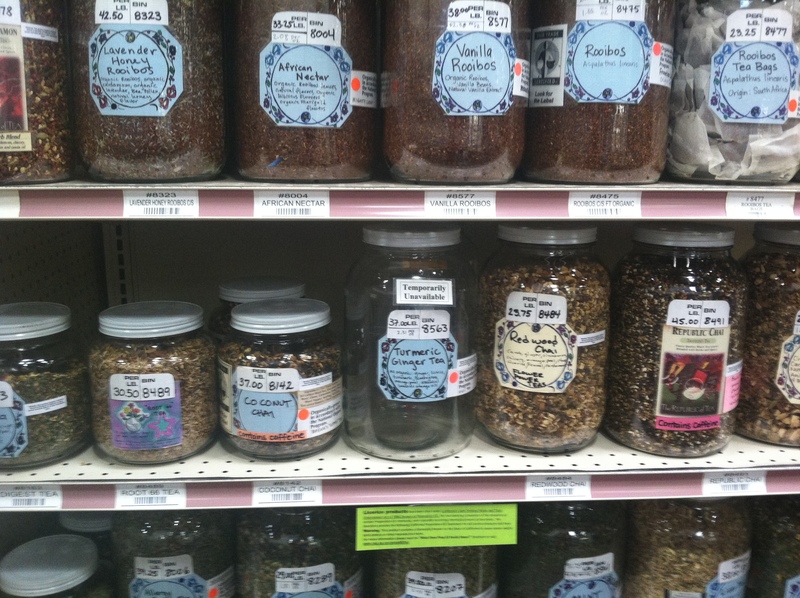 Salts, baking soda, nutritional yeast, dried bullion, cacoa nibs…you get the picture. 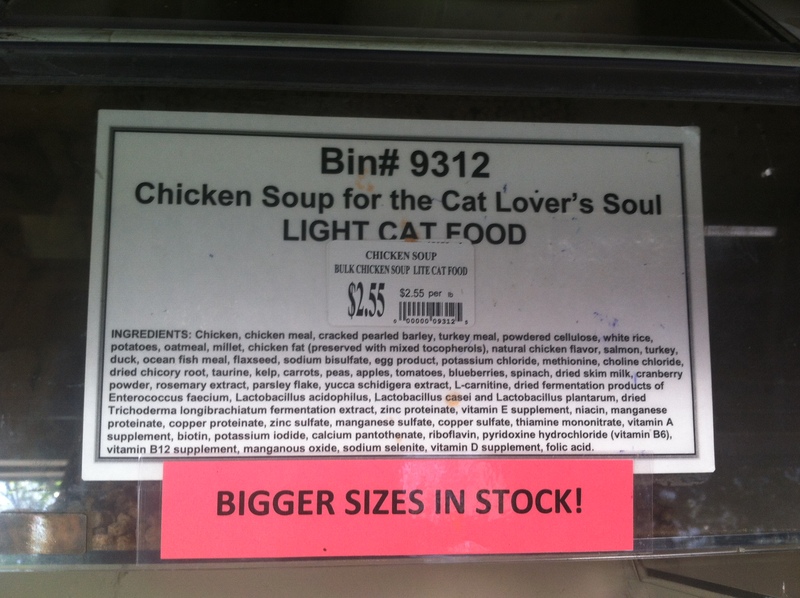 You can even buy bulk cat food or personal care products like lotions, soaps and shampoos. 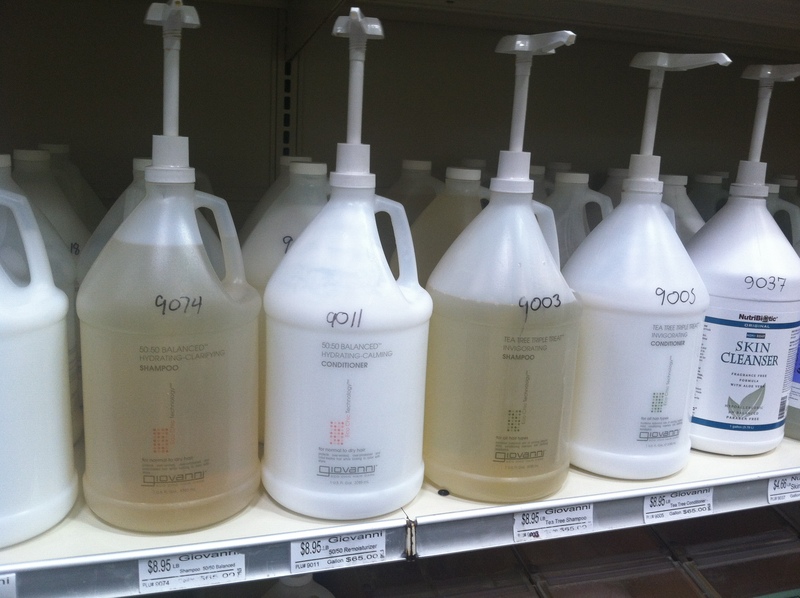 I wash my hair with baking soda and follow with a cider vinegar rinse, but my teenagers won’t go for it. Kids. Now before I went to the store, I had to prepare (which was not a big deal). First, I gathered a pile of my cloth produce/bulk bags. 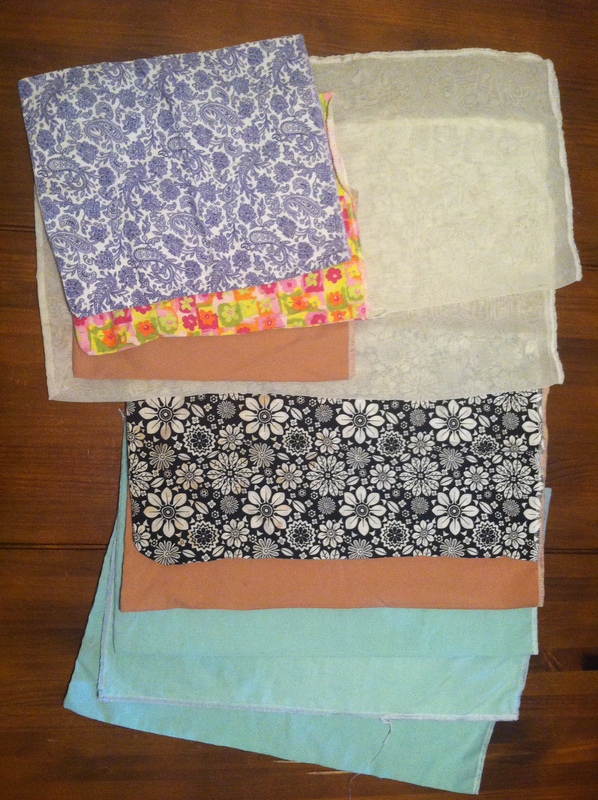 I made some of these a few years ago from old sheets my neighbor wanted to get rid of. I also took a bunch of clean glass jars. 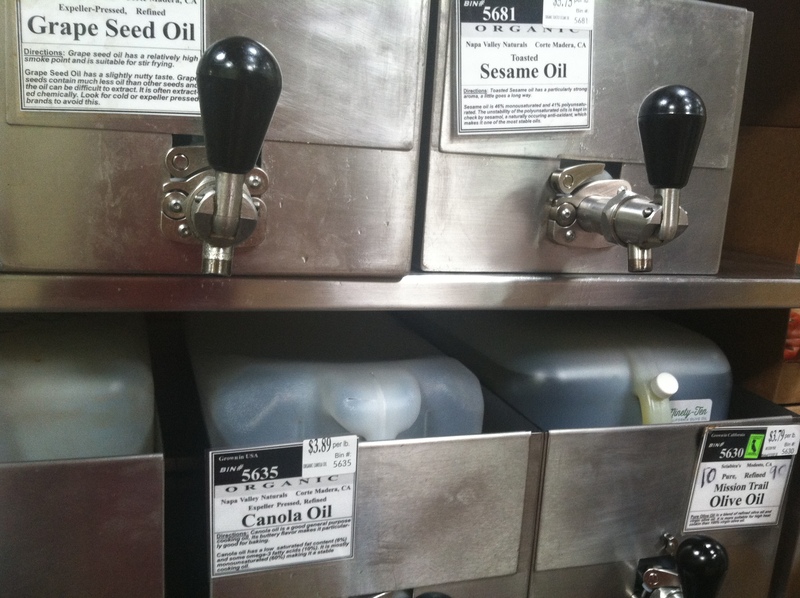 You can weigh these on scales at the store, or “tare” them, and then write the weight on the jar. The cashier will deduct the weight of the jar from your purchase. 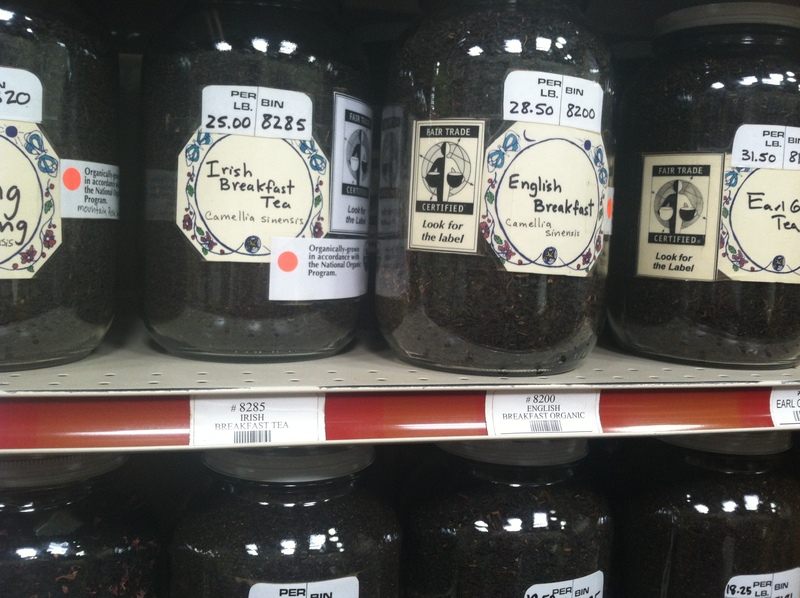 If you buy something like tea at $30 a pound, you really don’t want to pay for the weight of a one-pound jar. 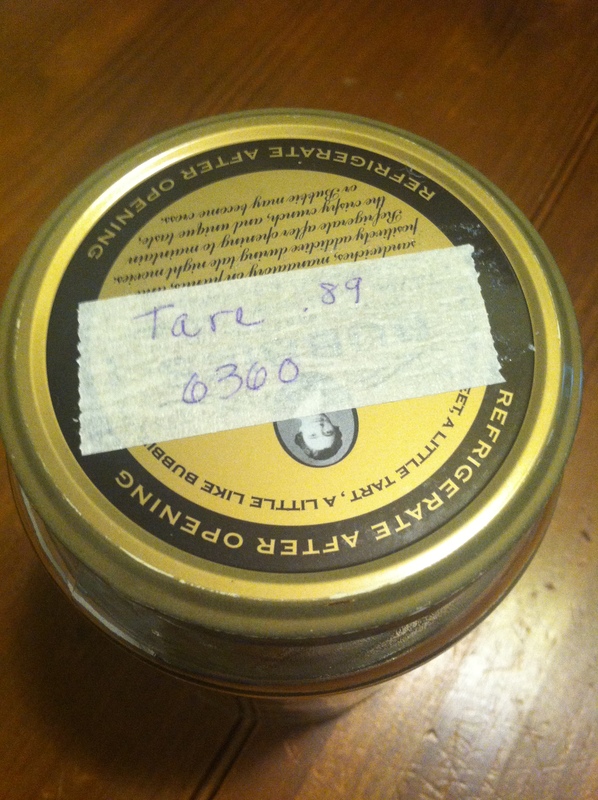 My cashier dutifully entered all the tares for my many jars. I bought lots of staples today, almost 100 percent waste-free (I used twist ties on my bags to close them and mark the bin codes). I even liked my cashier! He didn’t say much at first, and then halfway through ringing me up, he asked “What is your favorite word?” I didn’t have to think long about that. “Defenestrate,” I said. “That’s my favorite word too!” he said. I told him I also liked sesquipedalian. He added up thirteen bags and jars, plus my two big shopping bags, and took five cents off my bill for each one—75 cents total. 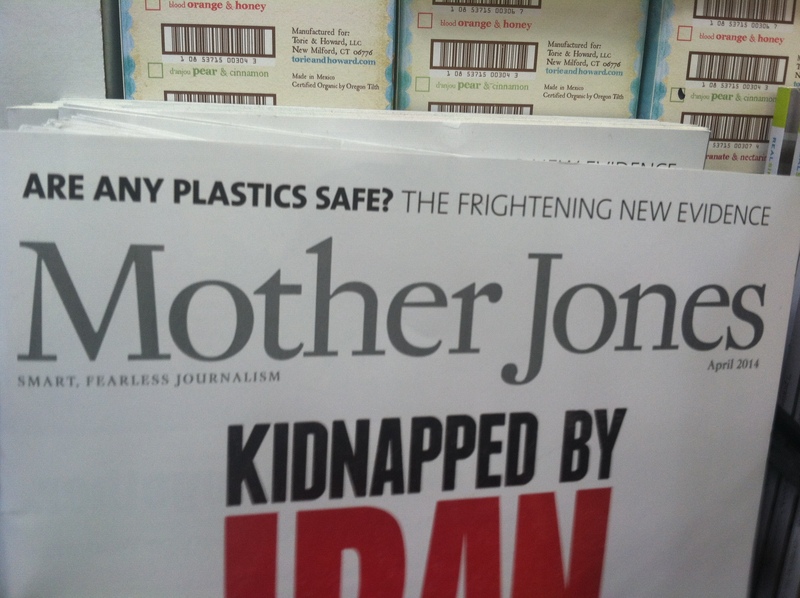 Here’s a magazine headline I noticed while waiting in line at the cash registers. I don’t think any plastic is safe. Even if eating food packaged in plastic were safe, the garbage is a disaster (plastic doesn’t get recycled much, the oceans are a mess, marine animals and seabirds are dying from ingesting it…I could go on and on). Buying food in bulk with your own containers helps cut down on plastic (and other waste) and you eat healthier food too (real food doesn’t come in plastic). Hello. I just discovered your blog and am reading several articles with interest. I am wondering about storing your food? How do you keep bugs from infesting your food? 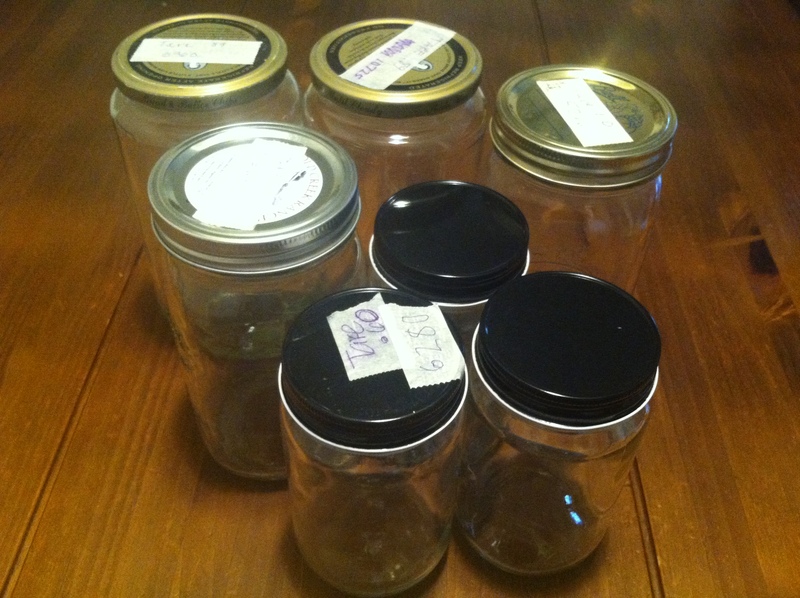 Do you store everything in glass after you bring it home from the store?